The state visit of China President Xi Jinping stirs various assumptions causing panic when reported Memorandum of Understanding (MOU) were signed between the two leaders. Among those who demand the full transparency of PH-China deal is Albert Del Rosario, former DFA Secretary. Does it have to be revealed? PDK thinks that the PH-China agreement is in the premature stage yet after one official declares that the country is free to walk away from the exploration agreement. The agreement is to reduce the tension between the countries as no country does not want to be limited in the Exclusive Economic Zone or EEZ. It is neither the Philippines nor other country’s. Also, she insisted that the issue does not bring matter on sovereignty but of national security. Although the Constitution states public transparency, however national security overrides such part given the fact that the other country is fully armed. Is it for public interest? 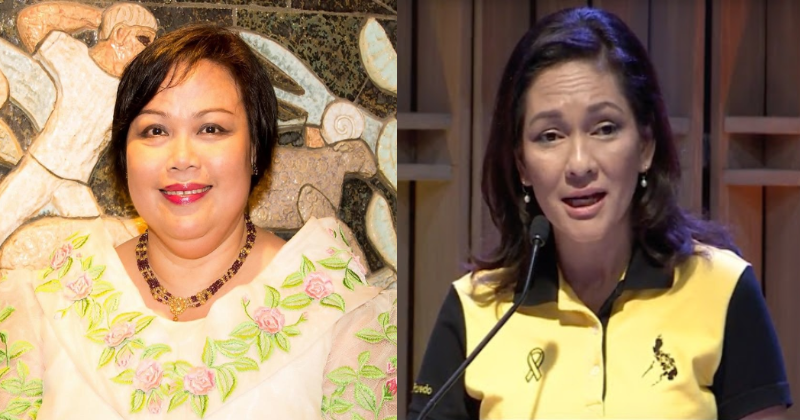 The act of pressing the president regarding the disclosure of the said agreement from the efforts of some politicians is not purely for public interest, as Knack claims. Provided the fact that it is not only China who has a dispute on EEZ, revealing the deal may inflict chaos where other countries involved may possibly act in defense of their interest. TO REVEAL or not to REVEAL the agreements ? I would caution everyone to go slow in revealing to the public what is the PH-China agreements pertaining to the SEA (as opposed to land-based agreements such as railway and infrastructure projs.) esp. if it is only preliminary. A govt. official said the country is free to walk away from the oil exploration agreement , therefore it appears to be a preliminary memorandum. These agreements are reducing tensions between our countries. Other than this option, no country wants outright delimitation of EEZ’s. EEZ's are not part of Philippine territory and ours overlap with many others. There is no violation of sovereignty, but there is a national security issue. The arbitration ruling itself did not rule on ownership of disputed territories. Hence, joint exploration is the only peaceful solution right now and we are not the first to enter into such an agreement. However, we are not the only 2 countries in the territorial dispute there, and the others are fully armed. Hence, we must be careful with our disclosures ESPECIALLY IN AN AREA WITH OVERLAPPING EEZ'S AMONG SEVERAL COUNTRIES. While the right to information of the public is ensured by the Constitution, issues of national security overrides such right. We are up against a military power and other countries who are likewise fully armed. TANDAAN NYO YAN. The Code of Conduct among ASEAN countries on matters pertaining to the sea has been pending for many years and we doubt whether China will agree to anything that touches on its claims. To expect the Code of Conduct to provide a holistic approach to the many issues involving the sea is unrealistic considering it is being drafted under China's watchful eye. Some eager senators linked with a rival power in the sea have been vocal in demanding the contents of the agreements. But the rival power has ONGOING business interests in the sea. The senators’ motives in pressuring the Exec. to reveal the agreement is not pure public service. The Exec. may have to invoke national security as the entire area is militarized. Revealing it might provoke other countries with conflicting interests to defend its interests. Take note, the arms race in the region was fanned by fear of competition rather than by actual use of force. On the other hand, did the rival power in the sea also disclose the contents of its agreements with other countries for all to see ? So why is everybody interested in seeing ours ? Should we disregard national security and eagerly hand over our agreement for other countries to see ? Which norm of international law says we should ? Si Hontiveros pang-kalye at rally lang. THE ARBITRATION RULING DID NOT RULE ON OWNERSHIP of disputed territories. Eh di labanan nya missiles doon sa dagat... PUNTA NA SYA DOON, NOW NA ! 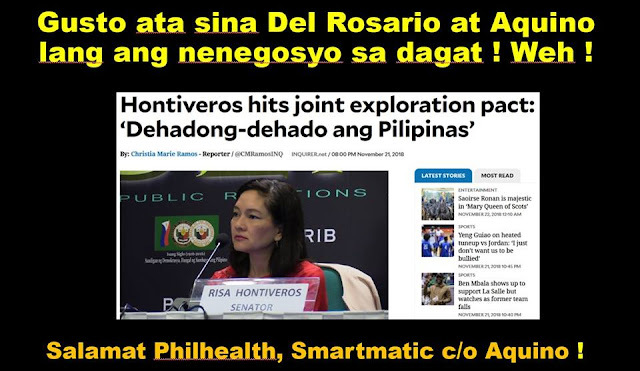 Kaya ikaw Hontiveros, dakdak ng dakdak ,the Constitution binds only the country, it does not bind OTHER COUNTRIES. It is domestic law. The Constitution itself recognizes international law (UNCLOS). But the arbitration ruling did not even rule on ownership. In addition, this is a territorial dispute among several countries. The joint exploration reduces tension in the region without directly addressing the territorial dispute because no single country wants to delineate overlapping EEZ's ! It is a peaceful solution to an otherwise explosive issue. How come Hontiveros is quiet over Del Rosario having conflict of interest issues on his business interest in the sea ?